Sawood Alam, Mat Kelly, Michele C. Weigle and Michael L. Nelson, "Client-side Reconstruction of Composite Mementos Using ServiceWorker," In JCDL '17: Proceedings of the 17th ACM/IEEE-CS Joint Conference on Digital Libraries. June 2017, pp. 237-240. There are primarily three ways to reference a resource from another resource, namely, relative path, absolute path, and absolute URL. All three have their own challenges when served from an archive (or from a different origin and/or path than the original). In the case of archival replay, both the origin and base paths are changed from the original while original origin and paths usually become part of the new path. Relative paths are often the easiest to replay as they are not tied to the origin or the root path, but they cannot be used for external resources. Absolute paths and absolute URLs on the other hand are resolved incorrectly or live-leaked when a primary resource is served from an archive, neither of these conditions are desired in archival replay. There is a fourth way of referencing a resource called schemeless (or protocol-relative) that starts with two forward slashes followed by a domain name and paths. However, usually web archives ignore the scheme part of the URI when canonicalizing URLs, so we can focus on just three main ways. The following table illustrates examples of each with their resolution issues. ServiceWorker is a new web API that can be used to intercept all the network requests within its scope or originated from its scope (with a few exceptions such as an external iframe source). A web page first delivers a ServiceWorker script and installs it in the browser, which is registered to watch for all requests from a scoped path under the same origin. Once installed, it persists for a long time and intercepts all subsequent requests withing its scope. An active ServiceWorker sits in the middle of the client and the server as a proxy (which is built-in to the browser). It can change both requests and responses as necessary. The primary use-case of the API is to provide better offline experience in web apps by serving pages from a client-side cache when there is no network or populating/synchronizing the cache. However, we found it useful to solve an archival replay problem. We created Reconstructive, a ServiceWorker module for archival replay that sits on the client-side and intercepts every potential archival request to properly reroute it. This approach requires no rewrites from the server side. It is being used successfully in our IPFS-based archival replay system called InterPlanetary Wayback (IPWB). The main objective of this module is to help reconstruct (hence the name) a composite memento (from one or more archives) while preventing from any live-leaks (also known as zombie resources) or wrong URL resolutions. The following figure illustrates an example where an external image reference in an archived web page would have leaked to the live-web, but due to the presence of Reconstructive, it was successfully rerouted to the corresponding archived copy instead. In order to reroute requests to the URI of a potential archived copy (also known as Memento URI or URI-M) Reconstructive needs the request URL and the referrer URL, of which the latter must be a URI-M. It extracts the datetime and the original URI (or URI-R) of the referrer then combines them with the request URL as necessary to construct a potential URI-M for the request to be rerouted to. If the request URL is already a URI-M, it simply adds a custom request header X-ServiceWorker and fetches the response from the server. 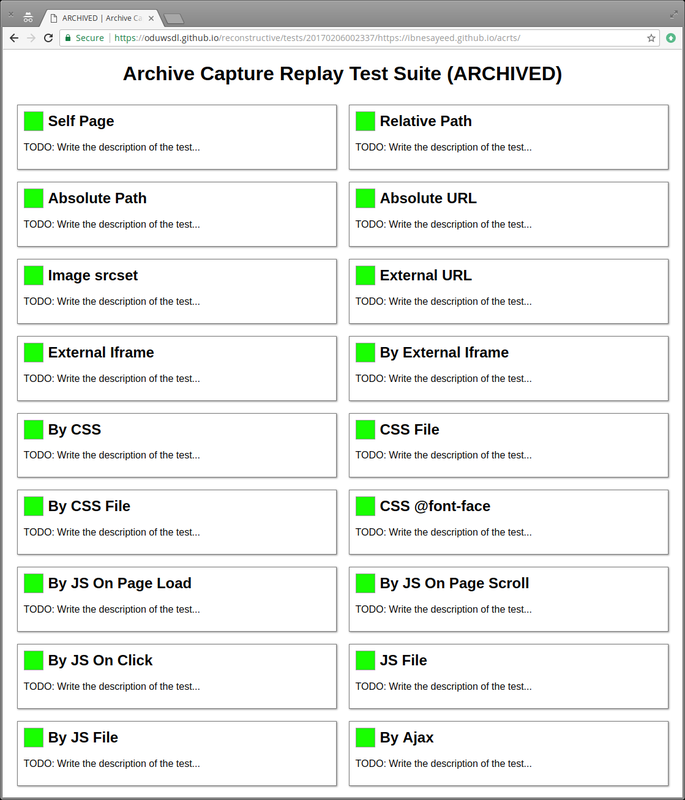 When necessary, the response is rewritten on the client-side to fix some quirks to make sure that the replay works as expected or to optionally add an archival banner. 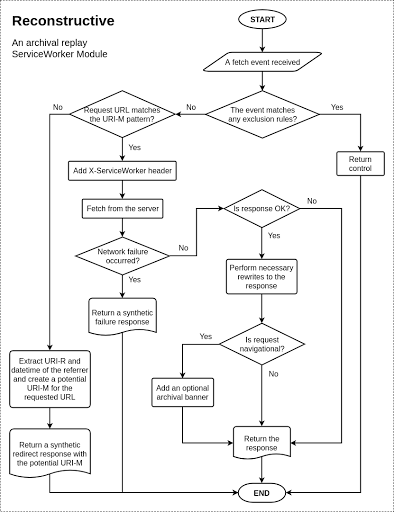 The following flowchart diagram shows what happens in every request/response cycle of a fetch event in Reconstructive. We have also released an Archival Capture Replay Test Suite (ACRTS) to test the rerouting functionality in different scenarios. It is similar to our earlier Archival Acid Test, but more focused on URI references and network activities. 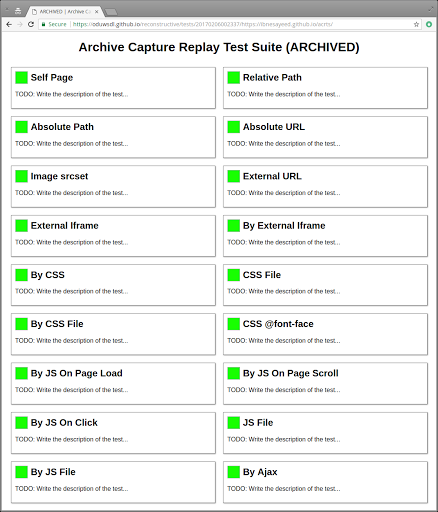 The test suite comes with a pre-captured WARC file of a live test page. captured resources are all green while the live site has everything red. The WARC file can be replayed using any archival replay system to test how well the system is replaying archived resources. In the test suite a green box means properly rerouting, red box means a live-leakage, while white/gray means incorrectly resolving the reference. The module is intended to be used by archival replay systems backed by Memento endpoints. It can be a web archive such as IPWB or a Memento aggregator such as MemGator. In order use the module, write a ServiceWorker script (say, serviceworker.js) with your own logic to register and update it. In that script, import reconstructive.js script (locally or externally) which will make the Reconstructive module available with all of its public members/functions. Then bind the fetch event listener to the publicly exposed Reconstructive.reroute function. 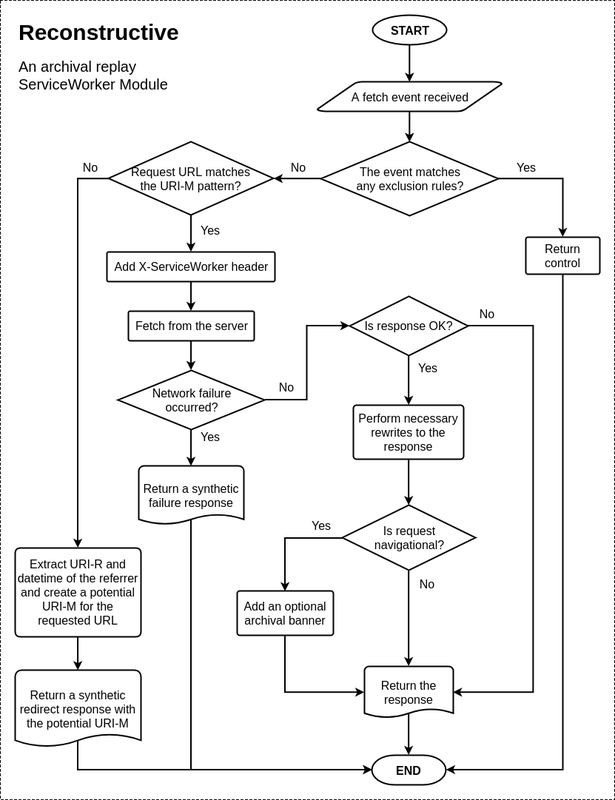 This will start rerouting every request according to a default URI-M pattern while excluding some requests that match a default set of exclusion rules. However, URI-M pattern, exclusion rules, and many other configuration options can be customized. It even allows customization of the default response rewriting function and archival banner. The module can also be configured to only reroute a subset of the requests while letting the parent ServiceWorker script deal with the rest. For more details read the user documentation, example usage (registration process and sample ServiceWorker), or heavily documented module code. Reconstructive module has implemented a custom element named <reconstructive-banner> to provide an archival banner functionality. The banner element utilizes Shadow DOM to prevent any styles from the banner to leak into the page or the other way. Banner inclusion can be enabled by setting the showBanner configuration option to true when initializing Reconstructive module after which it will be added to every navigational page. Unlike many other archival banners in use, it does not use an iframe or stick to the top of the page. It floats at the bottom of the page, but goes out of the way when not needed. The banner element is currently in its early stage with very limited information and interactivity, but it is intended to be evolved in to a more functional component. It is worth noting that we rely on some fairly new web APIs that might not have a very good and consistent support across all browsers and may potentially change in future. At the time of writing this post ServiceWorker support is available in about 74% active browsers globally. To help the server identify whether a request is coming from Reconstructive (to provide fallback of server-side rewriting), we add a custom request header X-ServiceWorker. As per current specifications, there can be only one service worker active on a given scope. This means, if an archived page has its own ServiceWorker, it cannot work along with Reconstructive. However, in usual web apps ServiceWorkers are generally used for better user experience and gracefully degrade to remain functional (this is not guaranteed though). The best we can do in this case is to rewrite every ServiceWorker registration code (on client-side) in any archived page before serving the response to disable it so that Reconstructive continues to work. We conceptualized an idea, experimented with it, published a peer-reviewed paper on it, implemented it in a more production-ready fashion, used it in a novel archival replay system, and made the code publicly available under the MIT License. We also released a test suite ACRTS that can be useful by itself. This work is supported in part by NSF grant III 1526700. Update [Jan 22, 2018]: Updated usage example after converting the module to an ES6 Class and updated links after changing the repo name from "reconstructive" to "Reconstructive". CS 725/825 "Information Visualization", Wednesdays 9:30-12:15 pm (CRNs 24134 & 24135) offered by Dr. Michele C. Weigle. This will be an updated version of the same course most recently taught in Fall 2017 (from which the figure above is taken). CS 432/532 "Web Science", Tuesdays 4:20-7 pm (CRNs 24600 & 24601) offered by Alexander Nwala. This will be an updated version of the course most recently taught by Dr. Michael Nelson in Spring 2017. Also, although they are not WS-DL courses per se, WS-DL member Corren McCoy is also teaching CS 462 Cybersecurity Fundamentals again this semester, and WS-DL alumnus Dr. Charles Cartledge is teaching two classes: CS 395 "Data Wrangling" and CS 395 "Data Analysis". 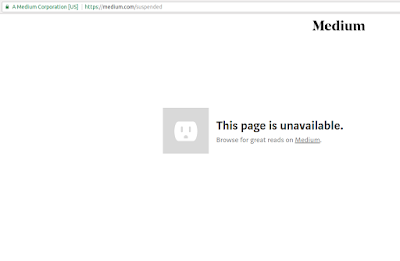 In a recent article in Wired, "Yup, the Russian propagandists were blogging lies on Medium too," Matt Burgess makes reference to three now-suspended Twitter accounts: @TheFoundingSon (archived), @WadeHarriot (archived), and @jenn_abrams (archived), and their activity on the blogging service Medium. With regards to the recent reporting around Russian accounts specifically, we’re paying close attention and working to ensure that our trust and safety processes continue to evolve and identify any accounts that violate our rules. 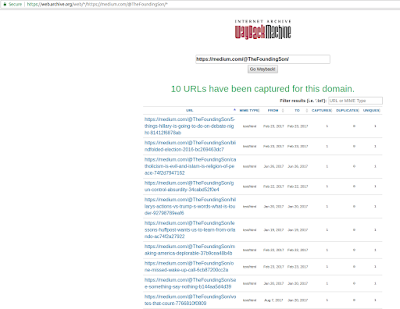 Unfortunately, to provide evidence of the pages' former content, Burgess links to Google caches instead of web archives. 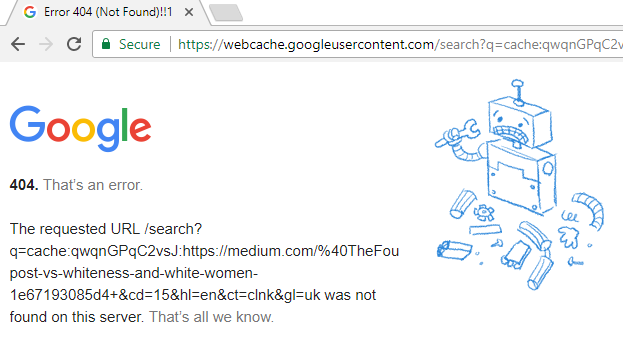 At the time of this writing, two of the three links for @TheFoundingSon's blog posts, which were included in Wired's article, produced a 404 response code from Google (the search engine containing the cached page) when clicking on the link (see Fig.1). Only one link (Fig. 4), related to science and politics, was still available a few days after the article was written. Why is only one out of three web cache links still available? 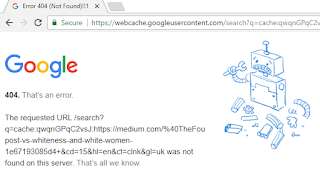 Search Engine (SE) caches are useful for covering transient errors in the live web, but they are not archives and thus not suitable for long-term access. In previous work our group has studied SE caches ("Characterization of Search Engine Caches") and the rate at which SE caches are purged ("Observed Web Robot Behavior on Decaying Web Subsites"). SE caches used to play a larger role in providing access to the past web (e.g., "How much of the web is archived? "), but improvements in the Internet Archive (i.e., no longer has a quarantine period, has a "save page now" function) and restrictions on SE APIs (e.g., monetization of the Yahoo BOSS API) have greatly reduced the role of SE caches in providing access to the past web. To answer our original question of why two of the three links were not useful can be explained in that since Burgess is using SE caches to provide evidence of web pages that are removed from Medium's servers, and scientific research studies have proven SE’s will purge the index and cache of resources that are no longer available, we can expect that all links in the Wired's article pointing to SE caches will eventually decay. If I were going to inquire about the type of blog @TheFoundingSon was writing, I could query https://medium.com/@TheFoundingSon from the IA's Wayback machine at web.archive.org (Fig.5). The archived web pages are in a time capsule preserved for generations to come, in contrast to SE caches which decay in a very short period of time. 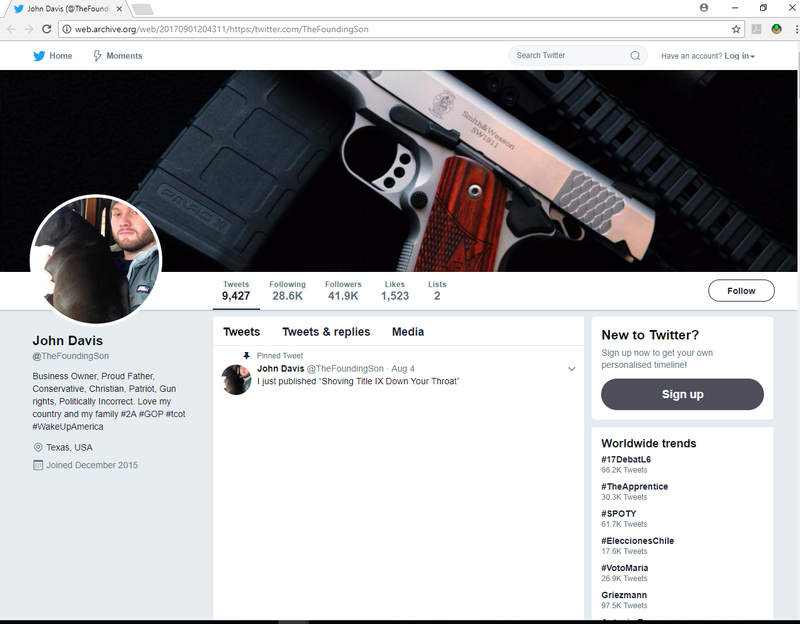 It is interesting to see that for @WadeHarriot, the account with the smallest number of Twitter followers before its suspension, Wired resorted to the IA for the 'lies' from Hillary Clinton posting; the other link was a Web search engine cache. Both web pages are available on the IA. Another advantage of web archives over search engine caches is that web archives allow us to analyze changes of a web page through time. For example, @TheFoundingSon on 2016-06-16 had 14,253 followers, and on 2017-09-01 it had 41,942 followers. The data to plot @JennAbrams and @TheFoundingSon Twitter follower counts over time were obtained by utilizing a tool created by Orkun Krand while working at ODU Web Science Digital Library Group (@WebSciDL). 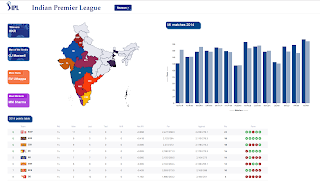 Our tool, which will be release in the near future (UPDATE [2018-03-15]: The tool was completed by Miranda Smith, and it is now available for download), makes use of the IA and Mementos. Ideally, we would like to capture as many copies (mementos) as possible of available resources, not only in the IA, but in all the web archives around the world. However, our Follower-Count-History tool only uses the IA, because some random Twitter pages most likely will not be found in the other web archives, and since our tool is using HTML scraping to extract the data, other archives may store their web pages in a different a format than the IA. The IA allows us to analyze our Twitter accounts in greater detail. We could not graph the count over time for @WadeHarriot's Twitter followers because only one memento was available in the web archives. However, multiple mementos were found for the other two accounts. 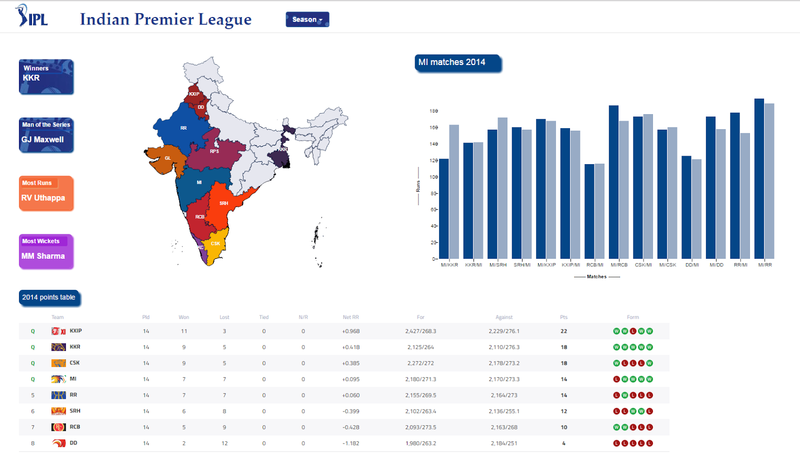 The Followers-Count-Over-Time tool provided the data to plot the two graphs shown above. We notice by looking at the graph of @TheFoundingSon that its Twitter followers doubled from around 15K to around 30K in only six months, and it continued an accelerated ascend reaching over 40K followers before its suspension. Similar analysis can be made with the @jenn_abrams account. 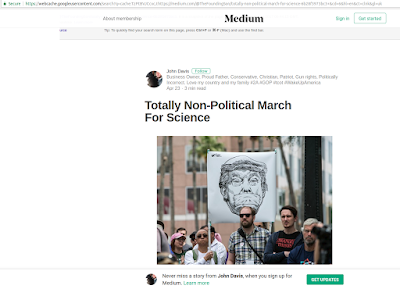 Before October of 2015 @jenn_abrams had around 30K followers, and a year later, it almost doubled to around 55K followers, topping over 70K followers before its suspension. 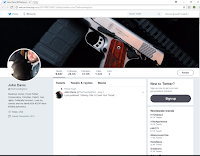 We could question if the followers of these accounts are real people, or if the rate of accumulation of followers followed a normal rate on Twitter, but we will leave these questions for another post. SE caches are an important part of the Web Infrastructure, but using them as a link is a bad idea since they are expected to decay. Instead we should link to web archives. They are more stable, and as shown in the Twitter-Followers-Count-Over-Time graphs, they allow us time series analysis if we can find multiple mementos for the same URI. HTTP responses for some links found in the Wired article. UPDATE [2018-02-19]: CNN said "cache" when it meant "archive". A CNN article made used of the IA to show the website (not longer available in the live Web) of a company accused of selling stolen identities of personnel living in the United States to Russian agents in order to facilitate banking transactions in the US. CNN used the term "cached version" to describe how they were able to make a link the past. CNN meant to use the term "archive".